Chiron is a planetoid that orbits erratically between Saturn & Uranus and is thought to form a bridge between these two giants. Unavailable after the passing of Al Morrison, the best of all Chiron books from the original Chiron researcher is back in a new edition. This is the book the others copied from. Find out what they missed - discover Chiron in your chart. Includes ephemeris, 1900-2050. Spiralbound. Chiron, bridge between old & new, ruler of Virgo & the 6th house & the next level of consciousness, which we are rapidly entering. Chiron through signs & houses, & in aspect to planets & moon's nodes. Chiron is the key to understanding the outer planets: Uranus, Neptune & Pluto. The result of study of 700 charts (55 included in the book) from the author's personal files. Paper. Chiron, the wounded healer. Co-ruler of Sagittarius & the ninth house, discover Chiron's roots in shamanism & Greek mythology. Chiron through the signs & houses & in aspect to other planets, Chiron & the spirit of the age. Includes 20th century ephemeris. Paper. 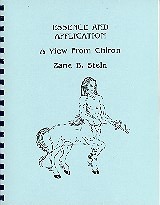 One of the earliest studies on Chiron, cited by many later writers. Explains Chiron's astronomical characteristics, reviews historical trends associated with its discovery, looks at the orbital cycle, examines the mythology of the chief centaur, tells what Chiron means in houses, in signs & in aspect to other planets. Paper.